Very rarely do we see patients who are allergic to only one thing. Treating multiple allergens simultaneously can help you address substances contributing to your total allergen load and more quickly bring your symptoms under control. We also find that most food-allergic patients have environmental allergies, so treating the environmental allergens first may reduce the total load, lessening the severity of reactions for some patients. After completing one or more allergy tests, you will meet with the physician to develop your custom allergy treatment plan that is developed specifically for your “allergic fingerprint.” Like most allergy practices, we will advise you on environmental control measures, dietary and lifestyle changes if necessary, and may prescribe symptom-relieving medications; however your need for these medications should decrease over the course of sublingual immunotherapy treatment. The red bottle drops are for patients with multiple moderate to severe allergies to pollens, mites and molds or a history of anaphylaxis. The treatment level is tailored to the patient’s skin test or blood test results. Patients take a dose three times daily using a metered dispenser. One bottle is a 90-day supply. This method is an add-on treatment for patients with strong seasonal symptoms to trees, grasses, ragweed, or dust mite taken prior to the heating season. A high dose of allergen is begun eight weeks prior to the onset of the allergen season and helps serve as a “booster” to reduce your symptoms when the actual season starts. Blue bottle drops are provided to patients who test positive for food allergies, and most often prescribed in conjunction with inhalant allergy drops. The treatment level for food allergy drops is based on the individual patient’s blood test results. Treatment levels are gradually increased as the patient’s test results show improvement. Patients take a dose three times daily using a metered dispenser. One bottle is a 90-day supply. 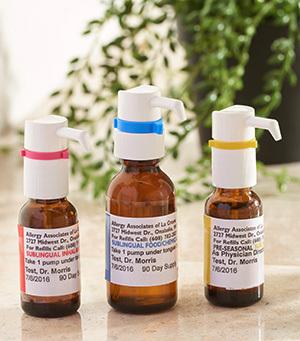 Your drops are a custom mix of those FDA-approved allergens that have shown to be problematic in your tests, mixed in a glycerin base for stability. We do not include allergens that you have not shown positive test reactions for, nor do we add other medications or preservatives. Most patients find the drops have a pleasant, slightly sweet flavor. As your tolerance to individual allergens increases, we will increase the allergen strength in your drops until you’ve reached a maintenance dose. You will continue treatment until your doctor determines through exams and testing that you can remain symptom free, which varies for each patient based on your adherence and the severity of your condition.